Doctors have been telling us for years that a glass of red wine at night may be good for our hearts. But they still can't tell us why, exactly. Does the answer lie in the antioxidants known as polyphenols, which may or may not boost blood-vessel function, improve cholesterol levels, and fight inflammation? Or does alcohol play the more important role? A small new study may provide a clue. To compare the effect of polyphenols and alcohol on blood pressure, researchers instructed 67 older men at risk for heart disease to consume the same beverage every day for one month at a time: red wine (about two glasses), non-alcoholic red wine, or gin (about two shots). Though modest, blood-pressure declines in the same range have been shown to reduce the risk of heart disease and stroke by up to 20%, according to the study, which was published today in the American Heart Association journal Circulation Research. "Our opinion is that [these] blood pressure-lowering...effects should be attributed to the polyphenols contained in wine," says senior author Dr. Ramon Estruch, M.D., Ph.D., a researcher at the University of Barcelona, in Spain. "Alcohol," he adds, "seems to counteract the effects of the non-alcoholic fraction in red wine." The researchers suspect that polyphenols lowered blood pressure by raising blood levels of nitric oxide, which relaxes the arteries and allows blood to circulate more freely. In the study, only non-alcoholic red wine was associated with an increase in nitric oxide levels. 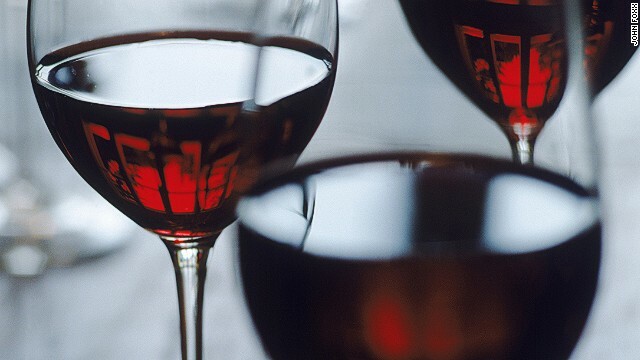 Despite the growing evidence of red wine's heart benefits, doctors generally don't recommend it to their patients because of the hazards associated with alcohol. Non-alcoholic red wine might be an option for people who want to consume polyphenols without the alcohol, Estruch and his colleagues say. The study, however, left several questions unanswered that will need to be addressed in future research. It's not clear, for instance, whether the same experiment would produce similar results in healthy people or in women. And the researchers didn't measure the exact polyphenol content of the wines, raising the possibility that some other property of the non-alcoholic wine helped lower blood pressure. Another important drawback is that the researchers measured blood pressure on one day only, at the end of each month-long period, says Dr. Sharonne Hayes, M.D., founder of the Women's Heart Clinic at the Mayo Clinic in Rochester, Minnesota. "Whether this [effect] would be sustained with longer-term use is unknown," Hayes says. I'm betting organic grape juice would be a good bet. Most organic, concentrated juices are far better tasting, and better for your health than the water-down version, which is often only 10% real juice, the rest water and sugar. Anyway, that's a good question! This study looked at blood pressure, but another factor in lowering the risk for cardiovascular disease is a better quotient between "bad" (LDL) and "good" (HDL) cholesterol. Smaller amounts of alcohol impoves that quotient. Thus, getting those polyphenols (mainly flavanoids?) with a bit of alcohol may possibly be at least as good. This research is interesting, but as far as a net health effect, the cholesterol part of the equation needs to be taken into account as well. I agree. I don't think alcohol is bad, if taken in well measured moderation. And I agree with your conclusion. The problem consists in that the limitations on how much alcohol you should consume also limits your intake of polyphenols in the case of red wine. Therefore, my solution for the past 10 years, has been to drink my daily 1 – 2 glasses of red wind plus res-juventa, a dietary supplement. See my other entries for details. The producer in Spain and the US distributors are registered with the FDA. what is non alcoholic red wine, where can u get it? This interesting clinical research has provided more information about the benefits of polyphenols in red wine. The research suggests that polyphenols lower blood pressure, but the researchers monitored blood pressure inadequately; on one day at the end of each month-long period?! Although the outcome measures were objective, the lack of rigor in the research methodology undermines the reliability and validity of the research. If you have inflammation problems then stay away from red wine, red meat and potatoes.....period. This confirms that I am doing the right thing by having taken for the past 10 years a dietary supplement from Spain which is made entirely of the Spanish blue grape's pulp, seeds, skin and stems. It's called res-juventa and every capsule is basically Spanish red wine without the alcohol. I am 51 now but feel like 35 and get a crisp clean bill of health in every check-up from my dr. If you open a capsule and put it in (even as much as a gallon) of water, it "converts it" visibly into red wine (but no alcohol!) I am thrilled about this report! That is a good point about not measuring blood pressure often enough. It needs to be measured more frequently and at different times of day to get a real sense of the range. Resveratrol is the polyphenol that is thought to be responsible for the beneficial health effects in red wine. Natural Standard gives it an evidence grade of C for cardiovascular disease which means there is conflicting evidence. Until more evidence comes to light, I prefer grape juice. That is a good point about not measuring blood pressure often enough. It needs to be measured more frequently and at different times of day to get a real sense of the range. Resveratrol is the polyphenol that is thought to be responsible for the beneficial health effects in red wine. Natural Standard gives it an evidence grade of C for cardiovascular disease which means there is conflicting evidence. Until more evidence comes to light, I prefer grape juice too, J. They measured blood pressure on one day...only one day. Maybe with more studies and actual quantification of the polyhenols you might be able to draw some conclusions. The results are interesting, but anecdotal. I agree completely with you, WhatNow. In fact, I chuckled at the statement about the blood pressure reading being taken on one day only. Hardly conclusive! Without alcohol, why drink wine at all? Just freeze dry the ingredients and take them in pill or capsule form? Clearly more research needs to be done on this subject, but I think this is a step in the right direction. I love fruits that have a high phenol content, like cherries and dark, red grapes, which is encouraging. Definitely adding women to the study would be necessary as well as taking several blood pressure readings at different times of the day and throughout the study. In the meantime, I think I will continue with my red wine with dinner (alcohol included!). Good idea Robyn. That is what I do too. Unfortunately my daily 2 glasses of red wine may be suboptimal when it comes to polyphenols (including resveratrol) and anthocyanins intakes. That is why I top it of with 2 res-juventa per day. (= 2-3 bottles equivalent of Spanish red wine, but without the alcohol as one really should not drink that much 🙂 ) You will see my other posts above for more details. Healthy regards! Hello, Neat post. There's a problem together with your site in web explorer, would test this? IE still is the marketplace leader and a big portion of people will omit your great writing due to this problem.